How do you become the leading polyurethane product manufacturer in less than two years? Ask the adhesive and sealant experts at ICP. In just two acquisitions, ICP expanded their technology and product offerings, becoming one of the largest companies to serve the polyurethane foam industry. ICP Group acquired FOMO Products, a leading manufacturer of low pressure-one and two-component polyurethane foam sealant and adhesive products, and a previous pressurized polyurethane foam adhesive acquisition from 3M, to add new technology, a newly expanded customer base, new manufacturing facilities, and more strength in raw material purchasing. Norton, Ohio –February 21, 2017 – ICP Adhesives & Sealants today announced the release of Polyset® Board-Max™, a new two-component, low-rise polyurethane foam adhesive engineered to secure insulation and cover boards to various roof decks and substrates. Used in conjunction with Polyset CR-20®, the new Polyset Board-Max kit eliminates the need for costly accessories and the associated maintenance, lowering labor costs and accelerating the roofing process. Polyset Board-Max is VOC-compliant and compatible with many different types of roof decks, cover boards and substrates. It features high yield, fast grabbing adhesive in an all-in-one kit, offering up to 30 squares of coverage. This results in better application times by reducing the amount of change overs between kits, making Board-Max both quick and easy to use. Its ready-to-use capabilities streamline the adhesive process while the large application temperature window provides contractors with application flexibility in all seasons. Board-Max can be used in ambient and on substrate temperatures down to 30° F (-1°C), eliminating the need for winter formulations. In order to maximize yield and help avoid off ratio dispensing, Polyset Board-Max also features ICP Adhesive & Sealants’ patented Colorwise® Temperature Warning Nozzles. These intuitive nozzles change from clear to blue, indicating that the chemical has reached a cold temperature below 60° F and the adhesive should not be dispensed until the chemical is warmed to the proper temperature. 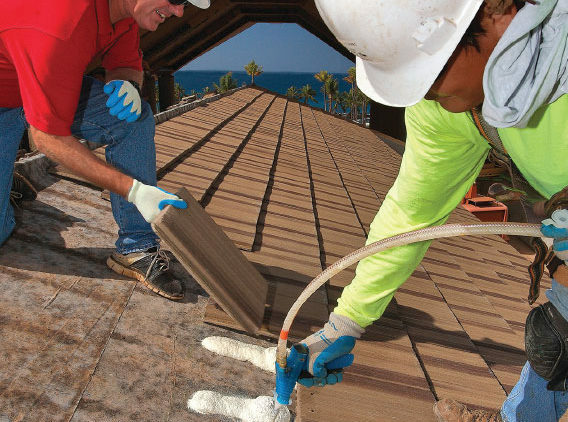 Polyset Board-Max is available through many national roofing distributors and ICP Adhesives & Sealants partner roofing manufacturers nationwide. refillable packaging. Our trusted brands include Polyset and Handi-Foam. For more information on ICP, visit www.icpadhesives.com. Innovative Chemical Products (the ICP Group) is a leading specialty chemical company engaged in the formulation, manufacturing, and marketing of coatings and adhesives. With operations headquartered in Andover, MA, and additional manufacturing and warehousing in Norton, OH, Waukegan, IL, Itasca, IL, Tomball, TX, and Coral Springs, FL., ICP serves the architectural, specialty construction, packaging, printing and sport surfaces end markets. ICP is privately held and manufactures products under several specialty brands, including Polyset, Handi-Foam, California Paints, Fiberlock, Dry-Treat, Storm System, California Sports Surfaces, Nicoat, MinusNine Technologies, and Rock-Tred. For more information on ICP Group, please visit www.icpgroup.com.